Description of the story "Truth Catalogue"
When a man is born into the world, he is born without any kind of belief. He grows up only knowing what he has been taught, but his mind expands as he moves to other environments. One basic fact stands; that there is “One God and the same is Creator”. 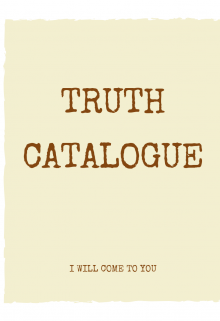 Hence, the aim of this catalogue is not to convert, but to share Truth, on a level that will inform all about the gospel of the Kingdom that must be preached before the end as written in Matthew 24:14. It doesn't matter your religion or atheist status, because the end is already upon us and it isn't entirely a one-day phenomenon. Today our world is filled with so much turmoil, but Christ said in John 14:18: I will not leave you comfortless: I will come to you.